On the 4th day of the epic SG/MY tour, we left Singapore to travel to Malaysia. We have been reading that it would be much cheaper to go from SG to JB then to KL, instead of from SG to KL so we went that route. 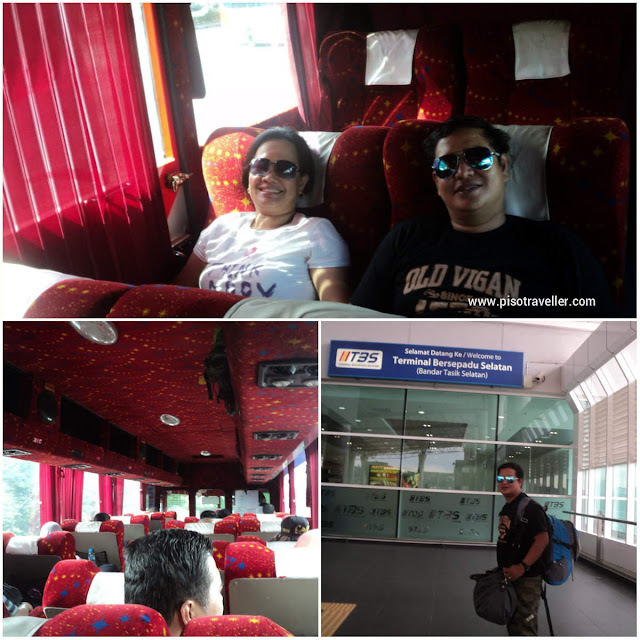 From our hotel, we walked a few blocks to the bus terminal using our trusty GPS and boarded the bus that will take us to Johor Bahru. Fare was I think SG$ 3-5. The travel from SG took maybe 40 minutes or 2 hours. I can't actually remember! Hahaha. At the SG immigration, you will have to go down from the bus and have your passport stamped. Then you will board the same bus (or the same bus company) for maybe 15 more minutes to get to Malaysian immigration. Remember to always keep your ticket with you! Then you line up again with all your bags in tow! There were very long lines inside the immigration (it was a Saturday, hu hu hu!). At the counter, the four of us in the group was called to another desk and we were asked to show the purpose of our visit, our hotel booking and our itinerary. It think we fit the profile of those jumping to Malaysia just to have an exit stamp from Singapore. Anyway, we were allowed entrance to Malaysia and then we were in Larkin after maybe 15-30 minutes. I can't remember exactly as were so tired lining up, carrying our bags and being profiled. In Larkin, we bought our ticket to KL by choosing among the many buses in the station. We choose the one that was leaving in a few minutes. Fare was around RM 30-40. Travel time was maybe 2 hours and we took the time to sleep. The bus goes straight to TBS in KL, their main bus station. We had lunch in the bus terminal. From there, we took a taxi to our hotel near Bukit Bintang. We had a bad experience with the taxi because he was trying to get us pay a fixed price and then we said we wanted it metered. We ended up paying more than what he was contracting us in the first place because he took us around just to make a point. Then we were at our nice hotel in Bukit Bintang by 5pm. So basically, we used one whole to travel from Singapore to Malaysia. But we had the evening to explore Bukit Bintang's street food market in Jalan Alor.